Sound the Trumpet! #10300 Set of 4 parts - for Trumpet with String Trio (Violin, Viola, & Cello..
Sound the Trumpet! 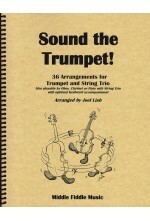 Trumpet #10301 by Middle Fiddle Music - arrangements by Joel Lish 36 Arrange..
Sound the Trumpet! Keyboard #10305 by Middle Fiddle Music - arrangements by Joel Lish 36 Arrang..
Sound the Trumpet! Alternate Violin II to replace Viola in String Trio #10306 by Middle Fiddle M..